TUNIS, Feb 16 2012 (IPS) - A month after the first anniversary of the Tunisian revolution, the North African country is being rocked by labour protests supported by the Union General Tunisienne du Travail (UGTT), the main labour union in the country. The protests are centered in the impoverished western regions. 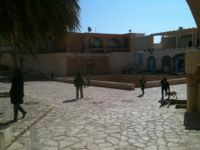 Gafsa is a neglected town. Credit: Jake Lippincott/IPS. The west of the country has been historically underdeveloped and ignored by the dominant coastal regions. This inequality has been a major cause of social unrest since at least Tunisian Independence in 1956. Last year’s revolution began in the western city of Sidi Bouzid, and a strike organised by the militant wing of the UGTT in the neighbouring city Gafsa back in 2008 is seen by many here as a precursor to the more recent revolution. Gafsa and the surrounding area are known for their rich phosphate mines. Mining is extremely profitable, but the workers in the mines and the residents of Gafsa see little of the profits, which have historically been reaped by coastal elites. The 2008 strike enjoyed the support of the UGTT’s rank and file, but it was quickly met with harsh and fatal government repression. The people of Gafsa hoped that the revolution of last year and the subsequent election would end decades of corruption and regional bias. But they have been disappointed. Last week, two Gafsa sisters in their twenties, Sousou and Asma Didi, spoke to IPS in the cafe area of the palatial Jugorta Hotel on the outskirts of the city. Despite the lavish design of the hotel, its pools and fountains were dry as a result of water shortage. Both sisters voted for Hizb Muqtamar (Congress pour le Republique), a centrist party in the ruling coalition along with the leftist party Ettakatol and the Islamist party Ennahda. Asked if she thought the ruling coalition was doing a good job, Asma said, “I don’t think so…” adding that the new parties should do more crack down on endemic corruption. Already impoverished people, she said, have to pay for access to basic services and employment. But despite this frustration, both sisters were quick to lay the ultimate blame for Gafsa’s problems on the door of the old dictatorship. “We are now at zero; it’s not easy to make changes now,” Asma said. Problems do not end with migration to the comparatively prosperous coastal regions. People from Gafsa and similar regions are easily identified by their dialect of Arabic. As a result, they face blatant and widespread discrimination. Rage over this injustice has frequently boiled over, even during the dictatorship when the authoritarian regime firmly supported the status quo. After major layoffs in 2008, people of the Gafsa governorate organised a mass strike that ended only when police began arresting and torturing organisers, and shooting protesters in the street. The UGTT has played an ambiguous role in both the Gafsa uprising of 2008 and the later revolution. The UGTT was recognised by the dictatorship, and its top posts were always filled by sycophants more loyal to the regime than to their constituents. But despite this the UGTT rank and file has been known for being stridently progressive and pro- democracy. Before the revolution the UGTT was the only major national institution where critics of the regime could attain some level of authority. Since the revolution, the union has been at the forefront of demands for greater regional and economic equality. Reached on the phone at his Gafsa office, the regional Secretary General of UGTT in Gafsa, Mohamed Sghaiyer Miraoui, supported the demonstrations and voiced the complaints of other people in his region. “The mine workers have already addressed the previous government asking for more rights,” he told IPS. ” (We demand) the right of employment – unemployment nears 60 percent in parts of Gafsa governorate; compensation to the families of martyrs that died (in the uprisings of 2008 and 2011), medical insurance for accidents at the work place; and social security for retired employees. No government has responded to these rights ever. Only words. In Gafsa and the arid villages around it, the poverty and lingering revolutionary graffiti are striking reminders of both how far Tunisia has come in the last year and how far it still has to go. The government here faces an uphill battle to create jobs and fight inequality.